(Ephesians 6:12)For we wrestle not against flesh and blood, but against principalities, against powers, against the rulers of the darkness of this world, against spiritual wickedness in high places. And my weapons are not ammunition or mortars, but the wisdom of God that I have learned from the Scriptures. (2 Corinthians 4:5)For we preach not ourselves, but Christ Jesus the Lord; and ourselves your servants for Jesus’ sake. When I preach and speak, I speak for Christ — His truth; not minding what will be its adverse effect on my person.I know that telling the truth will reap, for me, more enemies than friends; nevertheless, I must speak for Christ. (2 Corinthians 2:17)For we are not as many, which corrupt the word of God: but as of sincerity, but as of God, in the sight of God speak we in Christ. I have invited to take a ‘U-turn’ and dig deeper to find the roots of all the fraud and deceit that now dominates almost all sector of society — even the religious helm of it. The Jehovah’s Witnesses, a worldwide religious activity teaching that ‘Jehovah’ is the real and personal name of God; claiming more than 16 million adherents, has no less than the common denominator of all the false religions prophesied in the Scriptures. (1 John 4:1)Beloved, believe not every spirit, but try the spirits whether they are of God: because many false prophets are gone out into the world. 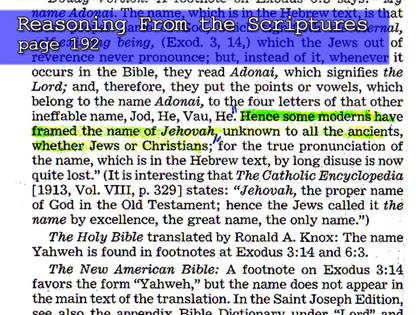 A very noticeable example is their belief of the name ‘Jehovah’.According to a 1950 edition of the “New World Bible Translation” of the Jehovah’s Witnesses, they are inclined to view the pronunciation YAHWEH as more correct, but retained the word Jehovah because it was popular among people.Meaning, adopting the word Jehovah is not for the sake of truth, but of popularity. After a few years of exposition in radio and television, wherein I extensively tackled the topic about the word Jehovah, I have noticed that deceit was employed in the next editions of the same bible translation of the Jehovah’s Witnesses. (See the difference below) In the 1950 edition, they (the Jehovah’s Witnesses) were the ones inclined to view that YAHWEH is more correct than Jehovah.In the 1985 edition, after realizing that my criticisms are rational, they deliberately changed the preface that they were not the ones “inclined to view” that YAHWEH is more correct, but “many”; throwing their garbage to other people’s backyard.Read the reference below very carefully. And if it is true that YAHWEH is more correct than Jehovah, as they have said, why can’t we find (all over the world) a single kingdom hall bearing the name “Kingdom Hall of Yahweh’s Witnesses”?Can you imagine the deceit being employed by these people? It has been habitual to the Jehovah’s Witnesses to change their teachings every now and then.They prophesied the coming of the Lord Jesus Christ as early as 1914.When it did not happen, they changed it again and again until scores of members left the society of these “false witnesses”. To the Jehovah’s Witnesses and my readers, remember that the ninth of the Ten Commandments says, “Thou shall not bear false witness against thy neighbor” (Exodus 20:16), it will be a greater sin against God if somebody will be witnessing something false about God. Maybe you will ask why I said in my previous article that my taste buds have been deceived.Well, it’s a side trip along our ‘U-turn’ as we continue traveling.I ask you to be patient. Who started all these lies being witnessed by the “false witnesses” of a false name: JEHOVAH?I invite you to read my next article. Previous StoryMagistrates Employing Deceit and Fraud?